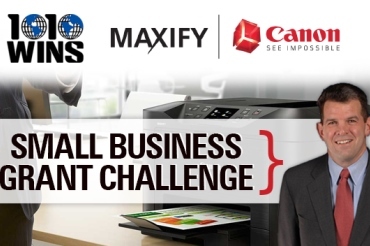 Turn your creative business idea into a reality with help from 1010 WINS with the 1010 WINS – Canon Maxify Printers Small Business Grant Challenge, and win $10,000. A maximum of 10 selected qualifying Contestants will have a chance to step on stage and give a 90 second “elevator pitch” followed by 3 ½ minutes of questions from the judges on Thursday, April 7, from 4pm to 7pm at the Adorama Live Performance Space at 1010 WINS. Small Businesses with up to 100 employees throughout the 1010 WINS listening area in the New York Metropolitan Area can enter this contest. Visit www.newyork.cbslocal.com/small-business-grant-challenge for more information. Contest Ends: 3/27/2016 11:59 PM ET.